COK to BLR back on I5's all new "RED"
After confirming my ticket for the onward journey, it was time to hunt for return tickets. I travelling just before Christmas, and hence fares were rising quite fast. I opted for a Sunday night flight from Kochi - and my options were Jet Airways, Indigo and Air Asia - and Air Asia was the cheapest among the lot. This particular flight sells quite slow - probably because of its unearthly arrival time at Bengaluru. Without thinking further, I booked my seat on this flight and chose a window seat (as usual) on the port side. With the SpiceJet turmoil leaving me confused, I quickly checked the refund policy of the Air Asia ticket I held. Thankfully, the ticket was not promotional and was refundable, although I'd get very little after the deductions. But then, SpiceJet came out of their mess partially and gave me the confidence that my trip was on. Once it was confirmed that the trip was on, I added a meal to my ticket - I was sure I'd be hungry on that flight. Like before every trip, I was glued to FR24 right from morning. 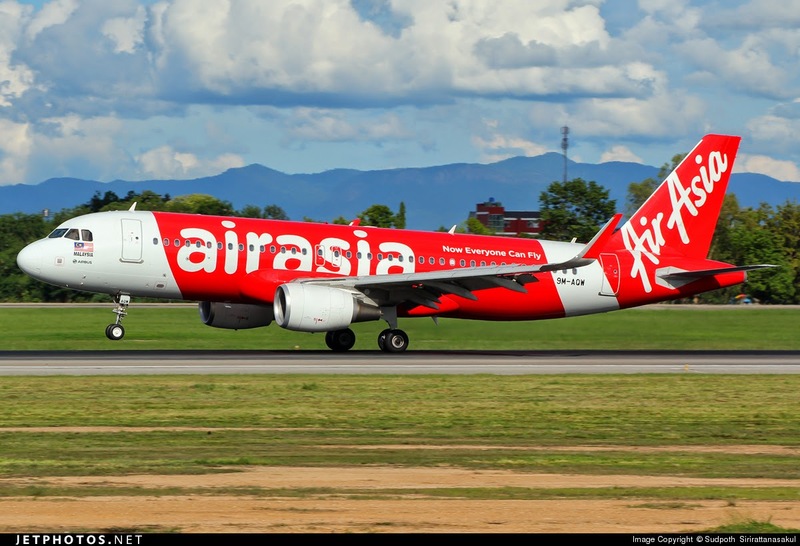 I noticed that AirAsia's newest bird (VT-RED) - not technically new, but around a year old craft handed down by the parent company - AirAsia Malaysia, had flown the previous night. The same bird came in to Kochi that morning as well. I was now busy working the sectors the bird worked, and was fairly sure that she'd be flying me that night. I was quite excited to be flying I5's latest aircraft (I also finish flying all the three aircrafts of I5 with this). I had received a message the previous night that my flight was rescheduled, and would leave 20 minutes earlier at 2250hrs instead of 2310hrs as on my ticket. 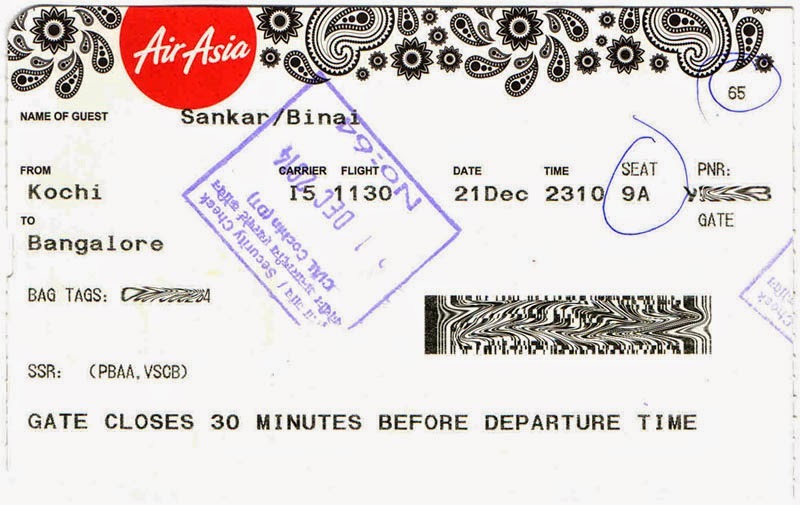 However an email from AirAsia claimed my departure was rescheduled from 2225hrs to 2250hrs! I left home sometime around 1845hrs, after an early dinner. 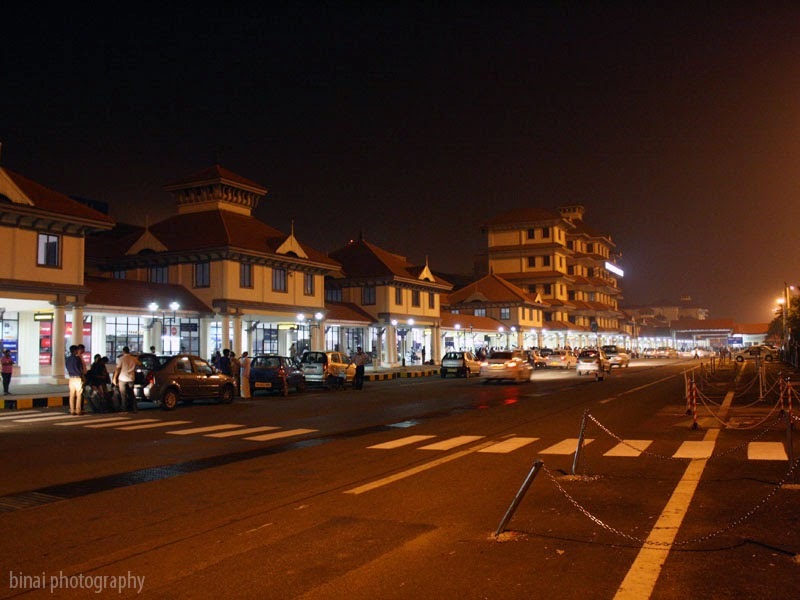 The airport is about 35kms from home, and I did not want to hire a cab. I had to change 3 different buses to get to the airport, and hence had to leave early. It was probably my lucky day - I got connections very quickly, and I reached the airport by around 2050hrs - a good 2 hours before my flight. The security personnel at the entrance to the terminal checked my ticket and the departure time twice before letting me in - he did not ask anything though. The terminal was fairly crowded - quite unusual for that time. I had check-in baggage this time, and hence headed straight to the baggage scan area. Check-in counters were deserted - There were three counters, and all of them were empty. I headed to the first counter - Ms. Aleesha welcomed me with a warm smile and checked me in - due to some error with the printer, the luggage tags did not print. She got a reprint quickly and handed over tags for the hand baggage, and my boarding pass. Security check was deserted as usual - all this left me wondering where did all the crowd in the terminal go. I was the sole person to pass through security - and my bag was double scanned here to. This time, the mobile phone inside my bag was the problem for them. I finally entered the Security Hold by around 2110hrs. The security hold was full though - most seats were taken, while the seats closer to the apron were empty. I grabbed a seat with a nice view of the apron, and switched on my laptop to tune in to FR24. I was quite shocked to find the incoming aircraft hadn't taken off from Bengaluru yet! In the meantime, VT-IFC of Indigo was getting set to depart to Chennai, and boarding had commenced for VT-SUK of SpiceJet (Q400) heading to Hyderabad. The airport was quite busy at this hour. Some time after SUK left for Hyderabad, an Etihad A321 (A6-AEC) headed out to the runway. Just then, Jet Airways' VT-JCN came in from Bengaluru. In the meantime, FR24 showed that VT-RED was on its way from Bengaluru to Kochi as I5-1129. This confirmed that we wouldn't be able to depart on time. This was followed by three back-to-back arrivals on the international side - VT-SCH (Air India's A319) came in from Mumbai, followed by Air India Express' B738 VT-AYA from Dubai and Air India's A321 VT-PPV from Delhi. After a short gap, Silk Air's B738 9V-MGE came in from Singapore. 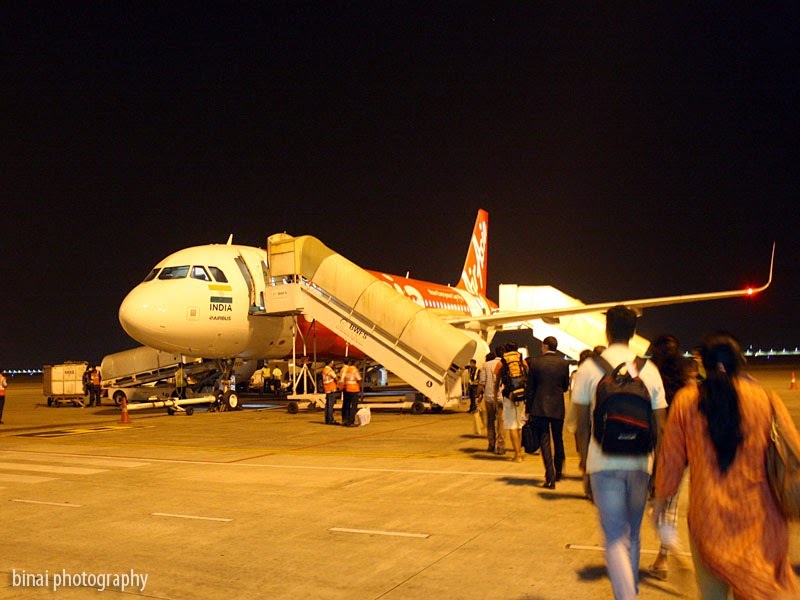 Finally, at 2239hrs, VT-RED landed at Kochi. By the time the aircraft came in to the apron, the first call for boarding was already made. Ms Aleesha was the gate agent as well. Another boarding call was made at 2248hrs, when the actual boarding process started. 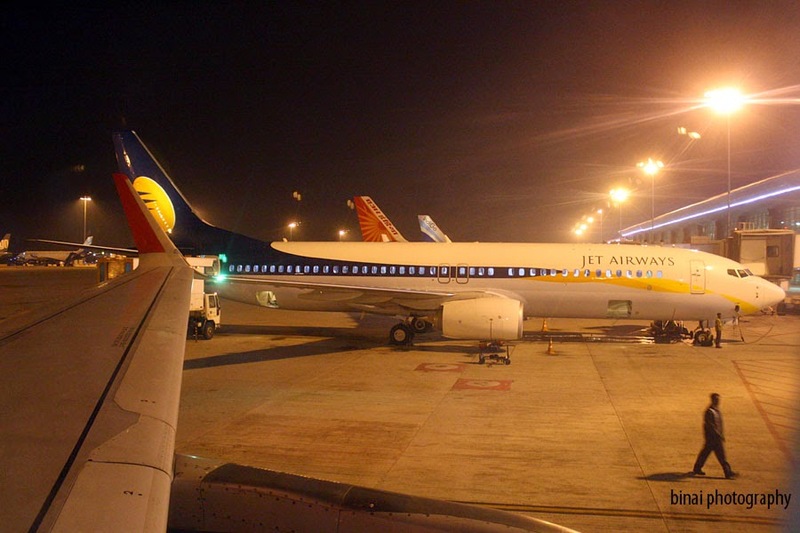 Initially they called for passengers seated in the first five and last five rows of the aircraft - but like in every Indian airport, hardly anyone bothered about the announcement, and chaos began. In the meantime, 9M-AHV of Air Asia came in from Kuala Lumpur. The boarding queue was a bit chaotic - with two CISF personnel checking boarding passes and luggage tags adding to the chaos. The aircraft wasn't yet ready for boarding and hence we were made to wait for a few minutes in the canopy outside the terminal. 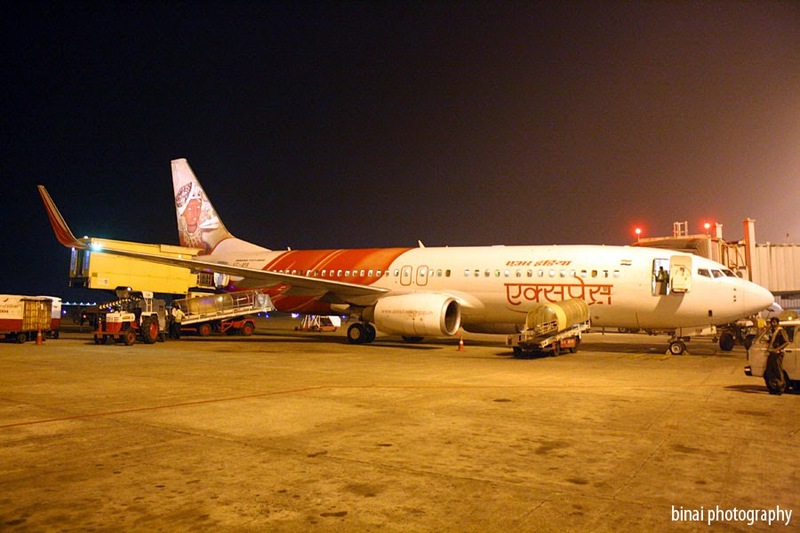 Since the aircraft comes right upto the boarding gate, passengers generally walk down to the aircraft. 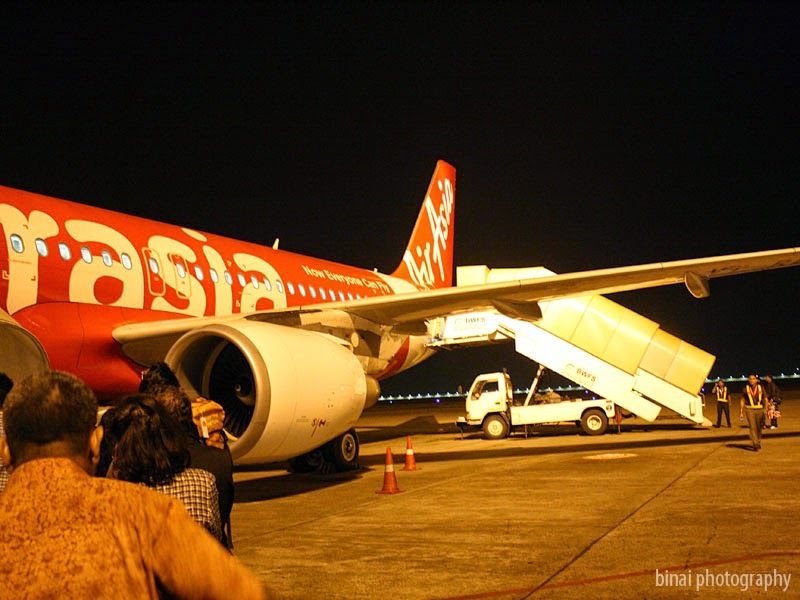 I was finally inside VT-RED, an Airbus A320-200 initially delivered to AirAsia (Malaysia) in October 2013 as 9M-AQW, at 2257hrs. Since boarding happened from both the doors simultaneously, things were moving quite fast. Boarding was completed and doors were armed at 2305hrs - the aircraft came in at 2239hrs, and 26 minutes later, the aircraft was ready to fly back! Absolutely no cleaning or other stuff - just come in, let the passengers out, take in new passengers, do a headcount and fly back! The rest of VT-RED. Boarding hadn't commenced yet. In the deck were Capt. Pravin Sharma (the very same person who commanded my last flight with I5) and First Officer Aldrin. Mr. Sandeep was the purser, and Ms. Annie (and two others) assisted him in the cabin. A quick welcome announcement was made by the purser and the safety demonstration began. Just as the demo began, the aircraft was pushed back (2308hrs). While we were getting ready to taxi, the Air India A319 (VT-SCH) heading out to Mumbai taxied out to Rwy27. We started our taxi at 2313hrs - but we turned straight to Rwy09. We headed to the holding point of Rwy09 and sat there till the AI A319 took off. It was a beautiful sight seeing two aircrafts waiting at either end of the runway all set for take off. 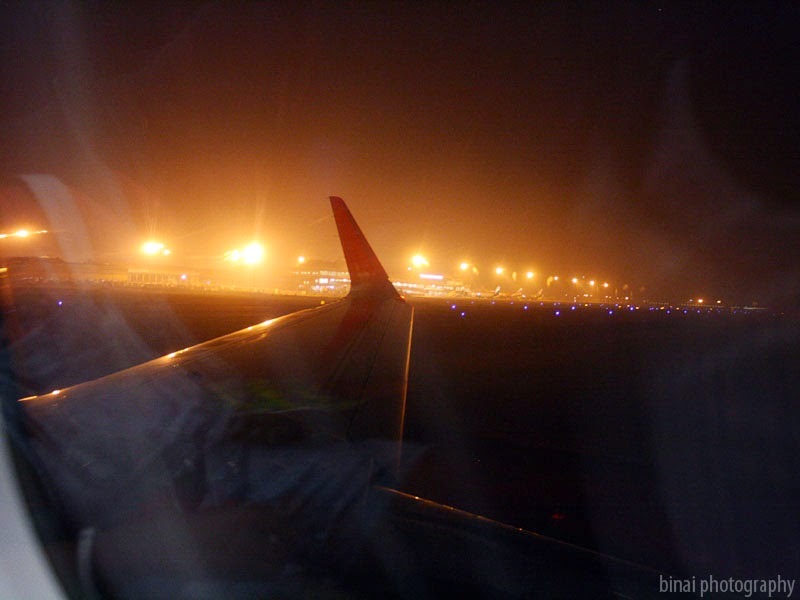 We were permitted to move out to the active runway at 2318hrs, and we were finally airborne at 2320hrs. About to take off from Kochi. Lights remained dimmed for most portion of the flight - I like it that way in late night flights. The buy-on-board service began soon after the seat belt signs were turned off - interestingly, they did not wheel in the cart, but the attendants came around asking everyone if they liked to buy something. My meal was brought in about 5 minutes after the B-o-B service started. I've always noticed that the pre-ordered meals are served in the rear half first and then in the front half - and the meals are actually bought from the rear galley. I had order for Vegetable Stroganoff with Parsley Rice. 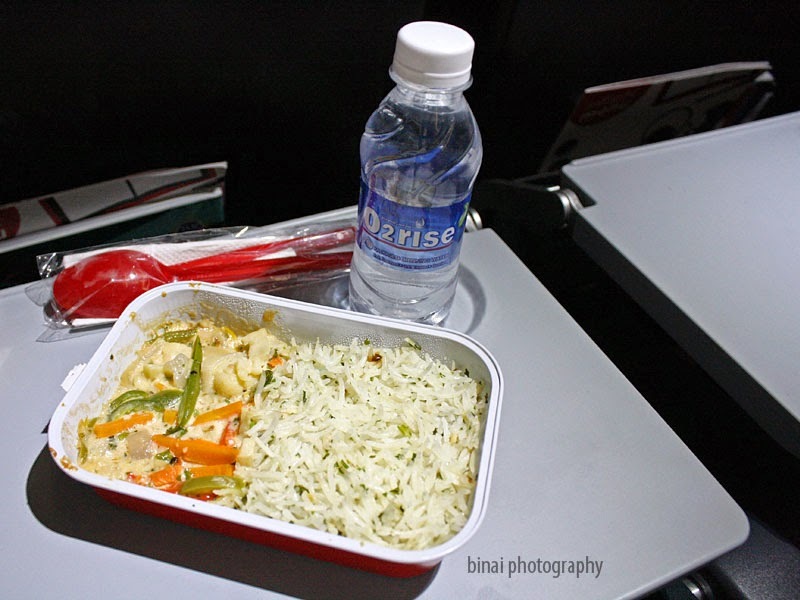 The meal was served really hot (piping hot) with 250ml bottled water. 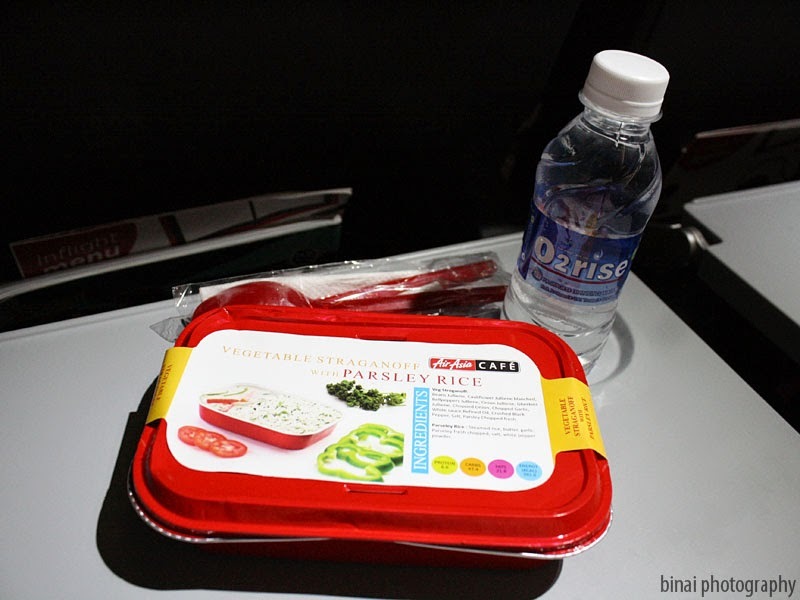 The meal was packed in a red coloured aluminum foil container along with red coloured plastic cutlery. The meal was tasty but the portion appeared too little. About half way to Bengaluru, the commander came on the PA and briefed passengers about the flight - he first apologised for the delay, blaming air traffic congestion at Bengaluru for the delay, then informed that we were flying at FL330, and are expected to land in Bengaluru only at 0005hrs, due to congestion there. Landing was announced at 2346hrs - soon after the seatbelt sign came on, the attendants came around to collect trash and ensure that the tray tables were closed and window shields were open. I expected some holding, but we directly aligned for landing, and finally touched down at 2358hrs on Rwy09. We headed straight to Stand 22 (a Jetway stand) and parked at 0001hrs. Even before we came to a complete standstill, the crowd to get off had formed. I got out of the aircraft at 0006hrs, and had the long walk to the baggage carousel. It took a long time for the bags to come, and I got my bag only at 0021hrs. I was out of the airport at 0023hrs. Although I got a bus immediately from the airport, it was almost 0050hrs by the time the bus left from the Airport, and I reached home at 0200hrs. On landing in Bengaluru.. Almost all the major Domestic players can be seen in this image..
Like the previous experiences, this time too, the announcements were a bit too fast to be comprehended. I am not sure if that is the company policy for them - it is somewhat like the announcements that follow a Mutual Fund TV Commercial. The inflight service was good - no pushing around the trolleys though. The cabin lights were dim throughout - letting passengers sleep for some time. I also noticed an inflight magazine Travel 3Sixty this time - hadn't seen this last time. Although they rescheduled the departure and asked everyone to come in early, we still left only at the original scheduled time! Overall a better experience than last time, but certainly nothing extraordinary. Its worth the money one pays, but would be better if they had better timings and punctuality. To Kochi - On SpiceJet, for the last time?